Are you tired of managing the installation of different cross-development toolchains on the same machine, fixing issues when your compiler does not work after a host OS upgrade or having to deal with the same toolchain being installed in heterogeneous environments? Docker fixes some of these issues by providing a light-weight virtualization layer that isolates the cross-development toolchains from the host OS, allows the easier coexistence of different tools in the same machine, and facilitates their management and deployability. # Root image built from LTS ubuntu in Docker Hub. # sure subsequent commands do not use old cache versions. # built, e.g. --build-arg UID=$(id -u) --build-arg GID=$(id -g). # Set up the compiler path and other container environment variables. # Set timezone and standard user. # Set up a build tools directory. # Install JLink as root, before changing to standard user. # Further operations as standard user. # Install the XMC library. # Install the ARM cross-compilation toolchain. # Required so that ccache files are kept in shared work directory. # Create a directory for our project and setup a shared work directory. This starts a container based on the previously created docker-arm-xmc image, allowing access to the JLink usb port from inside the container, and executes the make command. After the make command is executed, the container exits and we can see our compiled binaries as well as a directory with the .ccache artifacts which will be used the next time the make command is invoked. In subsequent posts, I will delve into additional development steps that can be realized with the help of this container. I hope you find this useful. This entry was posted in ARM, embedded and tagged ARM, docker, embedded on 27/11/2018 by jsolmen. Is it really possible to use the Beaglebone Black in industrial embedded projects? or it is just a maker/hobbyist platform? I have been searching for an industrial version of the Beaglebone Black in order to leverage the great know-how and resources available on this great open source hardware platform to make it work reliably on industrial environments. A professional version would allow e.g. better platform longevity planning, reliability, customization or industrial temperature ranges. Last year there were some efforts that did not get anywhere. The Beaglecore project in kickstarter seems like a great attempt at remedying this situation. It is a system on module (SOM) fully compatible with the existing Beaglebone Black, with features aimed at industrial computing and long-term availability. Help them achieve their goals! This entry was posted in ARM, Hardware and tagged ARM, embedded, linux, open source on 21/07/2015 by jsolmen. I was recently getting Data Aborts on an ARM11 program that makes intensive use on unaligned data accesses. The issue was caused by unaligned floating point accesses, which were not handled by the Linux kernel. Some background on the problem follows. ARM 32-bit instructions must always be word boundary aligned. Data accesses do not have this restriction. Prior to ARMv6 architecture, unaligned load and store memory accesses were treated as aligned by truncating the data address. Starting with ARMv6, unaligned word and halfword load and store data access is supported by issuing one or more memory accesses to read the required bytes transparently, albeit incurring in a potentially greater access time. U bit. Unaligned data access support enabled. This bit must be set in order to enable unaligned data access support. Disabling this bit means we must either provide an unaligned data access handler (like the one provided by the Linux kernel) or our software must be compiled with unaligned data access disabled by using the corresponding compiler option. A bit. Alignment fault enabled. When this bit is set, all unaligned data accesses cause a Data Abort exception, irrespective of the value of the U bit. When A and U bits are not set, legacy ARMv5 mode is enabled, where an unaligned data access is treated as aligned and the data address is truncated. The default configuration on ARM11 and ARM Cortex-A processors is U=1 and A=0, allowing unaligned half/word data access, otherwise having a strict word alignment check. Note that an unaligned multiple word access (e.g. long long) or coprocessor data access always signal Data Abort with Alignment Fault Status Code, even when the A bit is not set. Doubleword accesses must always be four-byte aligned. Our current compiler, gcc 4.6.3, produces code with unaligned loads by default, being not possible to disable unaligned access. Other compilers are able to produce code with unaligned data access disabled (e.g. CodeSourcery, with option –mno-unaligned-access). CONFIG_ALIGNMENT_TRAP is a kernel configuration option that makes non-aligned load/store instructions be emulated in software. Recent Linux kernels enable this setting by default. In fact, it is not even possible to disable this option with menuconfig (in order to make this setting visible with menuconfig, its description needs to be updated in arch/arm/Kconfig). On ARMv6 and later, this configuration option does not affect the initialization value of the CR1 register. This setting affects the software emulation for double word unaligned access while single word accesses are taken care of by the hardware directly (given our default A/U bit settings). If we disable CONFIG_ALIGNMENT_TRAP, double word unaligned accesses result on a bus error and program crash. int (32-bit). Unaligned data access is handled directly by the hardware with no kernel involvement (/proc/cpu/alignment is not affected). long long (64-bit). ARM processor cores do not support 64-bit unaligned accesses, so this is handled by the Linux kernel (/proc/cpu/alignment shows a DWord increment). The kernel traps an exception and the access is simulated. float (IEEE single precission, 32-bit). ARM processor cores do not support unaligned accesses to VFP hardware instructions. See below. This means that the kernel was unable to fix the Data Abort exception that took place. This problem can be fixed by compiling our software with floating point emulation (-mfloat-abi=soft), which can be performed by the Linux kernel but is normally more efficiently done by the standard C library. This has the drawback of slower code, which can have a performance impact on software that relies heavily on floating point calculations, like scientific applications or graphics processing software. The definitive solution to this kind of abort and the one we should always aim at involves fixing our software to always access floating point data on 4-byte aligned memory. This entry was posted in ARM, linux and tagged ARM, linux on 06/09/2012 by jsolmen. 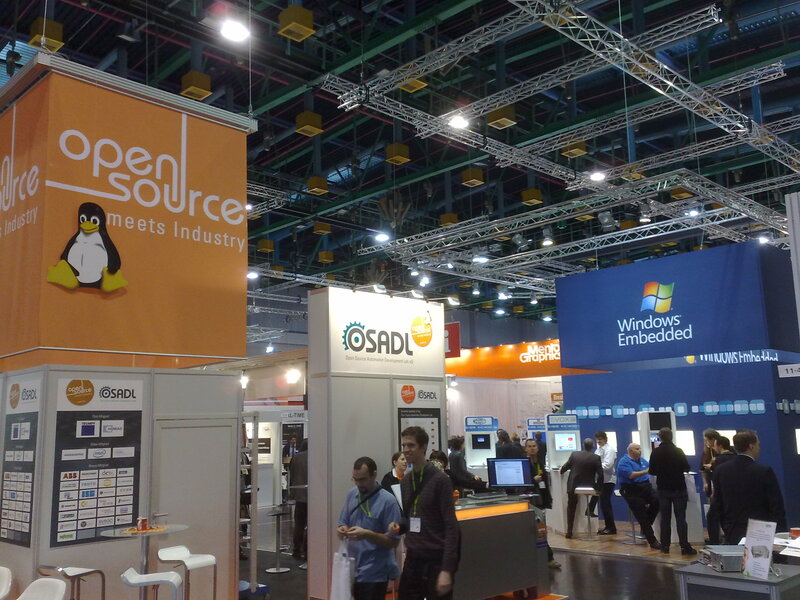 Linux usage is growing enormously in embedded systems, thanks to its stability, being open source, the availability of drivers for a huge amount of hardware peripherals and its support for many networking protocols and filesystems. However, Linux exhibits some drawbacks in safety systems, where the code needs to be certified, or hard real-time systems where deadlines are critical. Nowadays, some Linux installs in embedded systems have been deployed following a top-down approach, where no much care has been taken to remove unused software. This may have security implications, resulting also on code bloating and maintenance problems down the line of a software product lifecycle. I recommend following a bottom-up approach, where we control precisely the software installed in our systems. This helps in the long run with easier maintainability, and better security. Why is ARM the dominant architecture on embedded systems? ARM follows a fabless model, with licensees competing with each other on SoCs that include an ARM core and a number of extensions. This model, together with the efficiency and elegancy of their design has made them number one, especially in power-conscious designs like mobile phones. Beaglebone and Beagleboard, TI. ARM Cortex-A8. Product page. Dreamplug. ARM9. Product page. Product page. Gumstix Overo. ARM Cortex-A8. Product page. i.MX53 Quick Start. ARM Cortex-A8. Product page. ISEE IGEP v2. ARM Cortex-A8. Product page. Origen board, Samsung. Quad-core ARM Cortex-A9. Product page. Pandaboard. Dual-core ARM Cortex-A9. Product page. Raspberry Pi. ARM11. Product page. Snowball, ST Ericsson. Dual-core ARM Cortex-A9. Product page. This entry was posted in ARM, linux and tagged ARM, embedded, linux on 02/09/2012 by jsolmen. This entry was posted in Hardware and tagged Android, ARM, conference, embedded, energy, open source on 27/03/2010 by jsolmen.